Marcia is just 10 minutes by car from Bayeux. It is surrounded by lush green farmland, and is relaxing with a warm ambiance.It is a comfortable family home, well equipped, with pictures, ornaments, and photographs. The cottage offers relaxation and calm, with many comforts. Used by only myself for the majority of the year, you will find mostly everything you require here. Originally two cottages, it has skilfully been made into one, re-roofed in 1995 under slate, and receives every care and attention. The rooms are all of a good size, and ideal for small families or for 2 couples wishing to enjoy joint holiday. The garden has furniture, barbecue, and plenty of space for outdoor living.There is an orchard of cider apple trees. Owner is normally within easy distance during warmer months, for any assistance that is requested,. We are a bilingual couple, able to assist with such things as house purchase, or acquiring longer-term rental in the area. We are a retired couple who have been living in/visiting Normandy for many years. Jean is a French native having been born in St Lo and we met in Derbyshire in 1988. Jean has a brother and sister in Normandy. Our permanent home is in Derbyshire but we spend probably half of our time near to Bayeux. I am a retired Secondary school Head of Department and Mother to 6 boys, a family which has kept me very busy. Jean is a widower, a retired University Lecturer, and linguist. Jean has 3 children, all successful business people. We are keen caravanners. I love my gardening, DIY, sewing and when I have time knitting too. Jean is at present learning Spanish, as we enjoy winter holidays in Spain and the Canaries. We look forward to further future travel. Jean already knew the area as he was born there. He also has a family home there not far from Port en Bessin, so soon after we met we purchased the cottage. When we purchased, the main bedroom was approached by a ladder and it had one basic bathroom downstairs. My eldest son knocked a hole in the wall upstairs, allowing us to access the main bedroom from the main stairs. We love the area because it is so green and lush. I enjoy it at any time of the year. The cottage is very much a family home and place where my 3 youngest children spent most of their school holiday time. A lot of changes have been made. All our maintenance work is done during winter months, with family/friends. The cottage is 10 minutes from the centre of enormous historical and cultural interest. As well as this the area has wonderful beaches to offer for a really great summer family holiday. No where else can you see the Bayeux tapestry with such ease, explore the history of Bayeux and Caen, wander the streets of Bayeux, sample the many coffee shops and boutiques, or travel to see Mont St Michel, Arromanche, the American cemetery, the other landing beaches, Deauville and Trouville. Just a few examples of how interesting your holiday could be. The cottage is so very home from home and so very comfortable, with every convenience so you may just prefer to do very little. Certainly the garden at the cottage is just wonderful in the summer months. Great space for children. Hi-chair/cot available. En suite bathroom to bedroom one has bath, shower over, glass screen, basin and toilet. Cream tiled flooring and white wall tiles. Downstairs there is a shower room decorated in lemon and white, with basin and toilet. Traditional Noron tiled floor. The well equipped kitchen has cooker with gas top and electric oven, fridge/freezer, 12 place dishwasher, electric food mixer, microwave, electric toaster, coffee percolator, 8 settings matching china/ co-ordinated glassware. The Omaha International Golf course is just 20 minutes drive away. Unusual in that it has 3 x 9 hole separate courses,all very different in their presentation. Good golf house, with excellent "Table d'hote" and a la carte menu, as well as plat du jour. Every facility here, and visitors are made very welcome. Notes on accommodation: Strictly no smoking / no animals The property is suitable for children. Parents of older children may have to be prepared to drive for any night-life. There is a satellite TV in the lounge, and DVD player underneath. There is a small selection of films available, on loan for your holiday. Plenty of games and jig-saws are provided for family activity, and holiday bonding. From winter 2014 I will not rent during winter. Outside: The garden is child-proof, having hedges all around. Oceans of space for running around. Garden furniture for 6 visitors, recliners and cushions. Gas barbecue or traditional,whichever you prefer. Wood for log burner indoors is provided only between October and April. Gravel driveway gives ample parking for cars, but in any case, the orchard is accessible and any number of cars can be parked here. The lane outside is a country lane on which some, but not much, traffic travels. Cleaning / Towels / Linen / Maid service: Bed linen is included in the price. All towels for the bathroom are included. Towels and tablecloths, napkins, and T towels are included. We do not supply towels for using on the beach. For visitors staying 2 weeks servicing of property available weekly. Other: Kitchen is modern with every facility for those who enjoy cooking. Such items as soup tureens, fish kettles, electric slow cookers, food mixer, are all available. Pine table / chairs. Easy access to Bayeux. Central place for D-Day beaches as well as Lisiuex and Mont St. Michel. It was very quiet and peaceful at night. The nearby Abbey is beautiful. Host is very responsive. I would make two comments however. The bathroom set up is quite unusual, being open to the bedroom and on view from the door. This did not worry us, but I know people who would struggle with the arrangement and I think it should probably be made clear. Also, lovely as the house itself is, it really needs a lot of the personal memorabilia to be removed in order for it feel comfortable as a holiday let. Thank you for writing your review and adding your useful comments. I am glad you all enjoyed your stay. But it must be pointed out that my home is not a "holiday let". Highly recommend this property for a holiday! 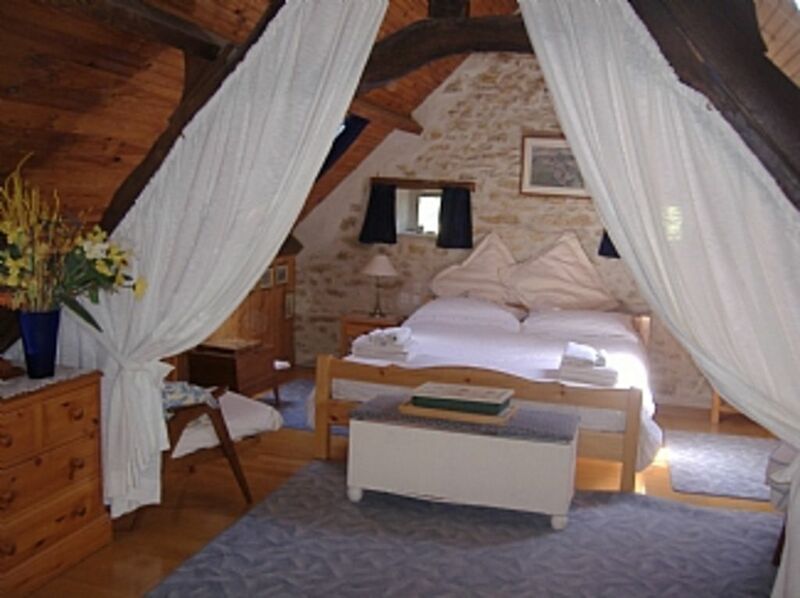 Having travelled to Normandy on several occasions and to date this is the best property that we have stayed in. The house is conveniently situated in a beautiful part of Normandy, close to Bayeux for The Tapestry, supermarkets and shopping. Not to distant are the WW2 sites i.e. D-Day landing beaches, Arromanche (Mulberry Harbour), Benouville (Pegasus bridge) and the military cemetaries (very emotional, especially if you are on a pilgrimage as we were). Just down the road from Marcia there is the Abbey Mondaye, well worth a visit, the sound of the bells will draw you there. The house is very comfortable set to a high standard with surrounding gardens and in an orchard in which the grand kids played and we relaxed. Dawn and Jean, the house is a credit to your refurbishment programme and we thank you for your hospitality shown to us during our stay. T C Scanes, Chelmsford, Essex. Our family had a great stay at Marcia cottage. The location was perfect for visiting Bayeux and the Normandy Beaches- most journeys took 20 mins by car. The owners were very welcoming and helpful and email communication and advise was prompt and useful. Recommended!! Our family had a great stay at Marcia cottage. The location was perfect for visiting Bayeux and the Normandy Beaches with a young family- most sights were 20-30 mins by car. The owners were welcoming and knowledgable. Email communication was prompt and useful. We would recommend a visit here! Russ / Becky B. B. We recently stayed at the very charming "Marcia" and felt the need to express our gratitude for the comfort we were provided. We knew it was going to be pleasant, but didn't count on the wonderful sounds of nature: the mooing of the cows, the chirping of the birds and the ringing of the nearby Abbey bells! We loved the day we took a break from sight seeing and chose to stay around to enjoy the peace and beauty of the gardens and the walk down the lane to the Abbey. The proximity to Bayeaux is important as that city offers many wonderful dining, shopping, and sight seeing opportunities. It made for a nice change of scene from the solemnity of the WWII sites. We have wonderful memories. This cottage is just 10 minutes drive from historic BAYEUX, and within very easy reach of all D Day beaches. Normandy is one of France's most historic regions, with a past which is intrinsically linked to that of English history, and so too, to the American peoples. We also look forward to the Bayeux Medieval Festival which runs every year during July.. This cottage is beautifully placed to enjoy all these exciting events. The "D" Day landing beaches are all within close proximity, as are numerous museums. Omaha Beach (St Laurent) is half an hour away. Arromanche beach is just 20 minutes, and there is a beach at Commes for those that are attracted to climbing cliff paths. Many others at a slightly further distance. Flying into Paris, you are just 2 hours away from the cottage by train, or 3.5 hours by car. There is a small airport at Caen for mainly french domestic flights. Use of car is essential, and car hire can be arranged locally in Bayeux, just below the train station at the Renault garage.on a daily basis if required. You can use Ryan air to fly to Dinard where car hire is essential. 2 Hours away. Port at Caen, where ferries come in-30 minutes drive away. Bayeux is approximately 10 kms away. The nearest village is within good walking distance,(half hours walk) and has a bar, small shop and bakery. D Day beaches approximately 20 kms away. Paris 3.5 by car, but only 2 by high-speed train. Mont St Michel about 2 hours by car. Suisse Normande is 1 hours drive away. Bayeux has several good supermarkets, and many banks. There are all types of restaurants available and a wide range of prices. This property does not become available before Easter 2019. Booking Notes: ALL PAYMENTS FOR THIS PROPERTY ARE NORMALLY IN euros BUT PLEASE CONTACT OWNER FOR UP TO DATE BANK RATE, should visitors from UK prefer to pay in sterling. A 25% deposit required to make the booking. A rental agreement sent out upon receipt of the deposit. The balance required 21 days prior to holiday, and upon payment of balance final details are sent by return e-mail. A separate security payment of £200 is required at the time of balance payment, returned after visit/after inventory has been taken. Cancellation policy: 59 days of arrival : full refund given 30 days of arrival : 50% refund given 2 weeks of arrival : no refund Changeover Day:Saturday Winter stays by arrangement direct with owner only- minimum stay - one week. (end October through to May 1st) Minimum 7 night stay unless by special arrangement.